Aomori Prefecture (青森県, Aomori-ken) is a prefecture in the Tōhoku region of Japan on the island of Honshu. The capital city is Aomori. Until the Meiji Restoration, the lands of Aomori prefecture were part of Mutsu Province. Aomori Prefecture is the northernmost prefecture on Honshū. The prefecture faces Hokkaidō across the Tsugaru Strait. 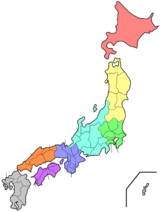 It shares its southern border with Akita Prefecture and Iwate Prefecture. Tsutsukowake jinja is the chief Shinto shrine (ichinomiya) in the prefecture. ↑ Nussbaum, Louis-Frédéric. (2005). "Aomori-ken" in Japan Encyclopedia, p. 35; "Tōhoku" at p. 970. ↑ Nussbaum, "Aomori" at p. 35. This page was last changed on 21 January 2014, at 00:19.